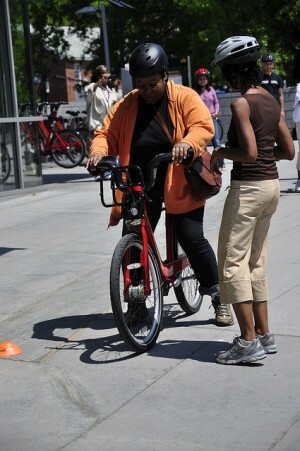 Elan Dawkins (left) gets some tips from instructor Marya McQuirter (right) before riding downhill on a Captial Bikeshare bike. Yvette Muhammad, who came to Saturday’s class to support some students, noted that Ward 8 is a food desert with high obesity rates. “So it could be a real benefit to people in this neighborhood if they were able to carry groceries [on the bikes],” she said. There could be more facilities, soon: Capital Bikeshare, a partnership between D.C.’s Department of Transportation and Arlington, is looking to expand its system by 25 stations this summer, and five of the possible additions are in Wards 7 and 8. But the list of possible stations is 55-long and there is plenty of demand in other parts of the city to contend with the relatively low usage of the existing stations East of the River. Muhammad pointed out that her neighborhood needs more stations to make a feasible alternative to other modes of transportation. “If you don’t live or work near one of these, then how would you get here to ride the bikes? It’s good to have it here but it’s just not the whole piece,” she said. The bikeshare system does work best when there are multiple stations clustered together, which is not the case in these parts of D.C. Also, you need a credit card to sign up, and even if you take a bike out for a day – daily memberships cost $5 – a $101 security hold is placed on your credit card in case the bike isn’t returned. Such a hold could push some people over their credit card limits. 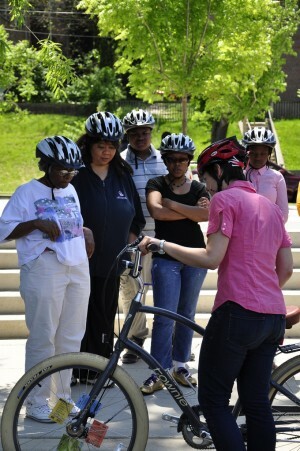 During the class, the teachers provided instruction on how to properly care for and maintain a bike. One of the lessons included getting the right kind of lubricant for bike chains. “You can go to a bike store to get that,” instructor Marya McQuirter said. But then she acknowledged that the closest shop was on Capitol Hill. “Maybe we could open one up here,” said instructor Sarah Miller. Perhaps. Or maybe as more adults ride bikes in the neighborhood, there will be enough of a demand for a bike shop to open independently. That’s the goal, anyway. This is a good story about what seems to be an excellent idea, but it doesn’t actually talk about race or class; we’re just supposed to read between the lines. It’s good that residents in the neighborhoods for which the program is targeted are there, but for all we know the ones that showed up are just early gentrifiers, which would suggest they’re not exactly who the program is targeting. The only mention of a potential class difference is a quote that refers to tougher economic conditions. It can be exhausting to continually regurgitate what “east of the river” means, but it would seem that in in the context of this blog it’s necessary to include something concrete. Thanks for your comments. I will definitely be mulling over them.